As promised here I am with my “Chingrir malaikari” recipe to mark the 2000+ hits of my blog. 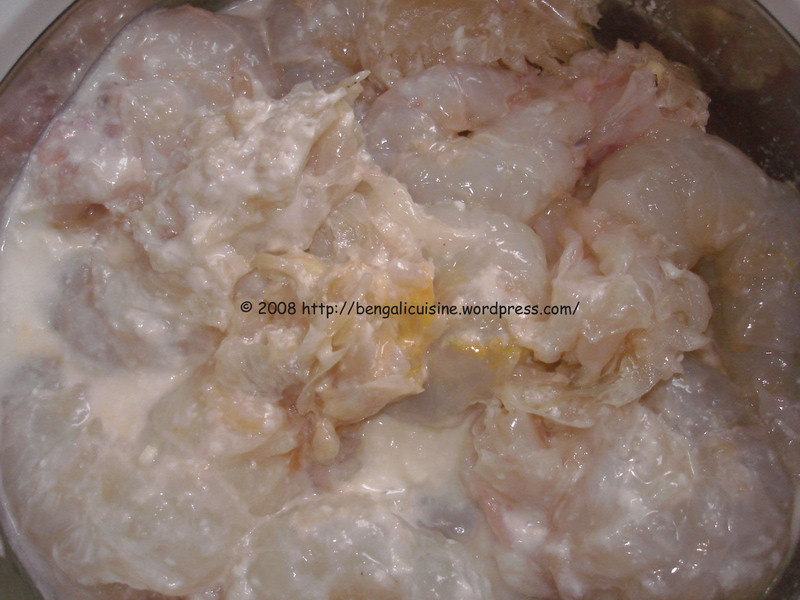 Prawns are always a delicacy in all Bengali household and even those who loves fish but are afraid of those bones. I would share one very interesting fact about prawns, though we call it Chingri mach(fish) in Bengali , but actually it is not a fish. 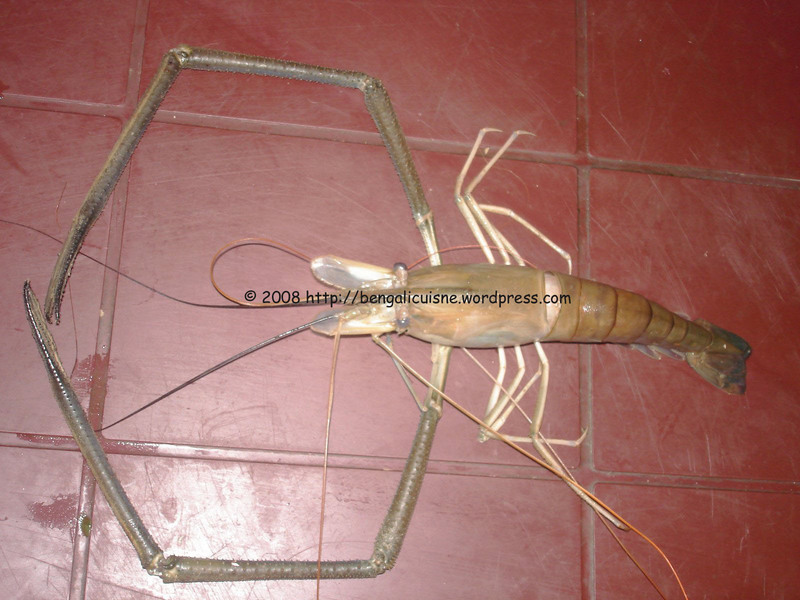 According to the characteristics of prawns scientists have grouped it as an arthropode,i.e, it is an insect. You can also use shrimps for this preparation. Just a few words before we start with the cooking procedure. Prawns are very delicate, so beware when you are deshelling them. Keep the head of the prawn intact, but wash it carefully. Marinade the prawns after washing with curd and garlic ginger paste for at least an hour. Heat the ghee in an wok and add the whole garam masala, sauté for just a minute. Add the marinated prawns to the wok. Sauté the prawns for just a few minutes so that it becomes a bit stiff. Add the coconut milk, chilli powder,ginger-garlic paste, salt and turmeric powder. Cook till the gravy thickens. Serve with rice and enjoy the delicious but easy to cook chingrir malaikari. Keep looking for more recipes here. Till then happy cooking and happy eating. Sending this to Sunita’s Think Spice event of the month. Sending it to SWC-West Bengal hosted by Lakshmi of Cooking Station. Thanks to all my dear viewers for making my blog a success. It has crossed another hurdle , today I can proudly declare my blog to be among the 2000+ viewer blog group. It felt so great to see that 2006 hits when I logged in this evening. And hold on, my blog has attained this new feather in just 3 months. Ok, may be with the delicious “Chingri macher malaikari”. 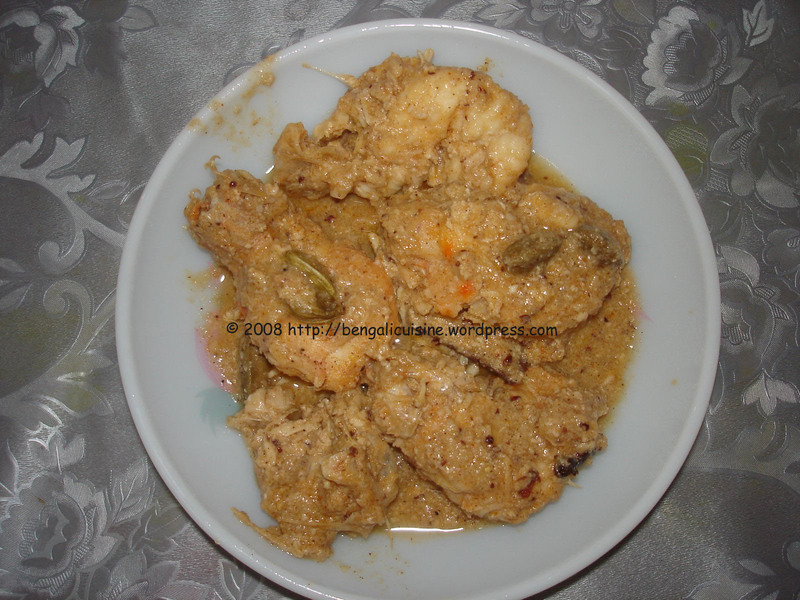 So my post coming up will the Chingri macher malaikari (Prawn in delicious coconut gravy). So watch out for it.